It's been awhile since we've talked Etsy around here. My bad! 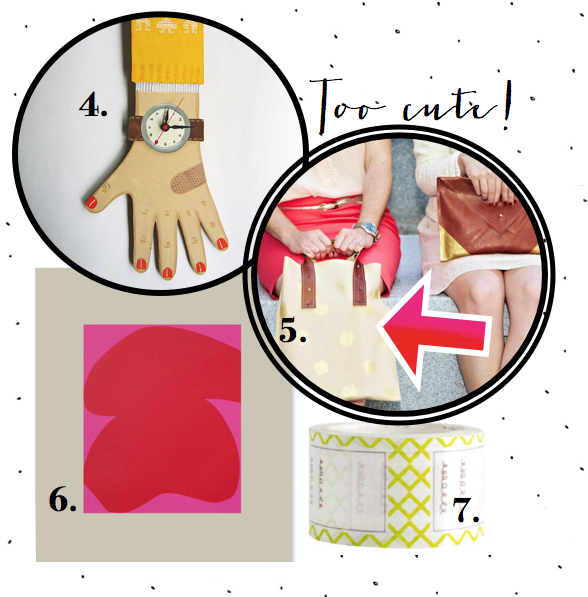 I hope you enjoy some of my latest and greatest finds -- treasures that triggered me to push that little heart button! "Hello, my name is..." -- These name tags by Sparrow Nest Script give the traditional sticker a fun and whimsical twist. You can sign me up for any shindig if I get to wear one of these! Endless Bummer -- I'm rather smitten with this sturdy and simple tote by Field Guided. I think the JUMBO size bag would be great for beach towels! Bumble Bee Bobbi Pins -- An adorably dainty detail! The Sweater Clock Hand -- Words can't describe how much I love this handcrafted piece by Sandra Eterovic. Gold Polka Dot Tote -- This courier by Matine is a need, right? As you may have already guessed, it was love at first sight. Oh, and they make it in a clutch form as well! I die. Red Leaf -- Why wouldn't I love a print that includes my favorite vibrant color combo of red and pink? Green Label Masking Tape -- This is like Washi heaven. My other go-to color combo would have to be chartreuse and white, and this DEFINITELY takes the cake! 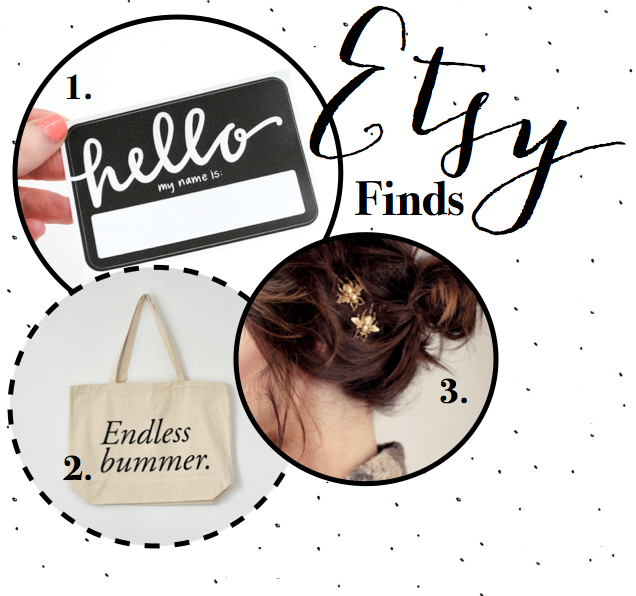 Have you spotted and hearted anything on Etsy recently? Smitten with a new shop or vendor? Remember the Etsy etiquette around here... I'll show you mine, if you show me yours! Excellent, as always. I almost don't feel so bad for Etsy-stalking you. Sidenote: Remember that time we were going to be penpals?